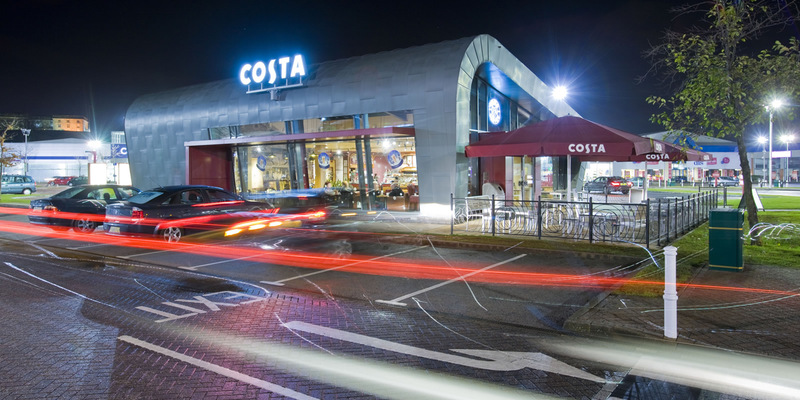 One of the first drive-thru coffee shops in the UK, this new concept store for Costa invites shoppers at Castle Marina Retail Park to either sit in and relax, or simply grab a quick coffee fix on the go. The striking design of the store makes a bold visual statement, therefore immediately drawing the attention and curiosity of visitors as they arrive at the retail park. 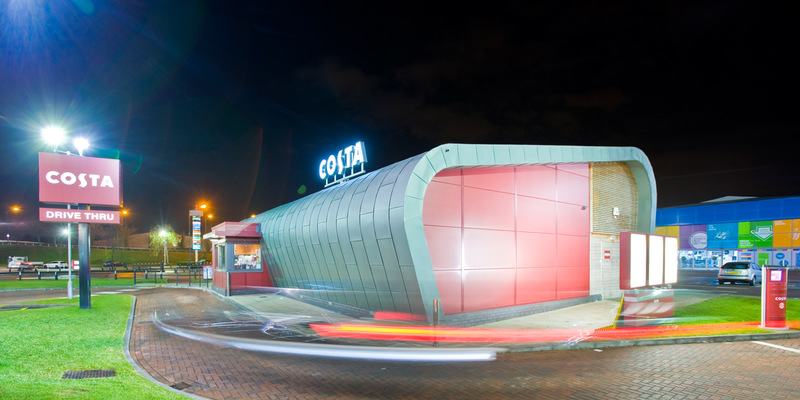 The architectural style, colour palette and materials were chosen to achieve a design that captured a strong sense of Costa’s brand identity. JWA’s contribution to the value engineering process helped bring the project within budget, therefore providing a cost-effective model that can be duplicated or adapted across multiple sites at low construction costs. The curved profile is achieved using a steel structure clad in treated aluminum panels, hand-formed on site. 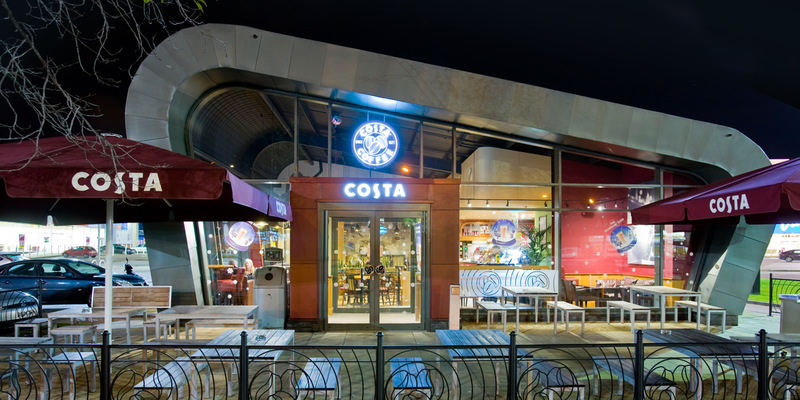 Inside, Costa’s usual décor combines with high curved ceilings, exposed steelwork and suspended lighting. Full height glazing to the front and raked glazing to the side elevation create a bright space and welcoming atmosphere. 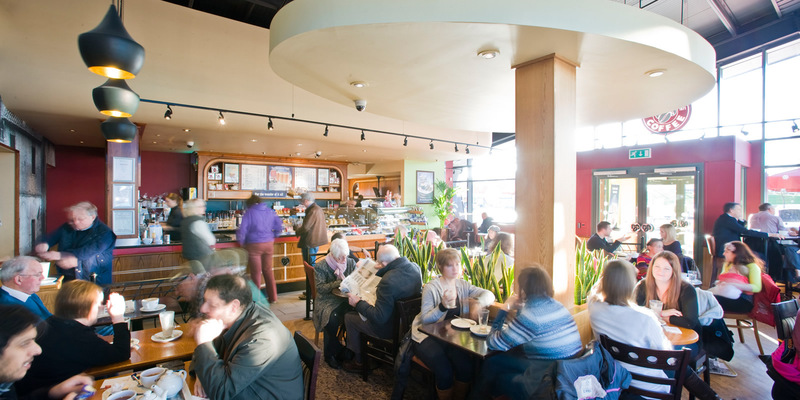 The result is an enhanced Costa experience that far exceeded sales expectations. As such, a nationwide development programme has launched that will see more of these drive-thru stores open across the UK.